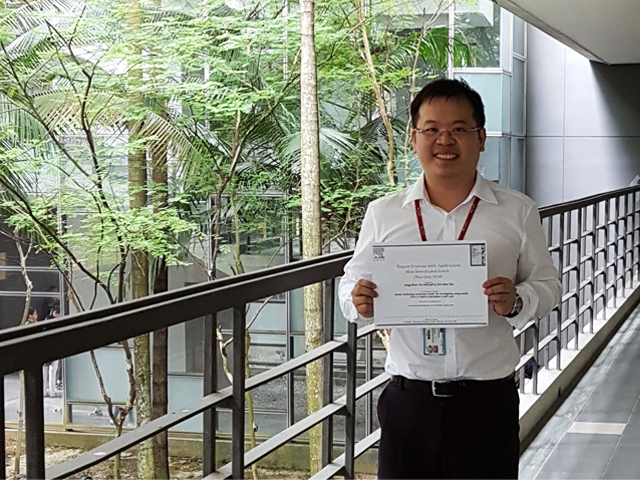 After being acknowledged with the “2015 Highly Commended Award” by Emerald (UK)’s Journal of Service Management, Faculty of Business and Finance (FBF) Senior Lecturer Garry Tan Wei Han’s paper on mobile technology was also awarded the “Most Downloaded Article” by Elsevier (USA)’s Expert Systems with Applications journal. Titled “Mobile Technology Acceptance Model: An Investigation using Mobile Users to Explore Smartphone Credit Card”, the paper was co-authored with Prof Ooi Keng Boon of UCSI University and sheds light on the applicability of Near Field Communication (NFC)-enabled smartphone payment in Malaysia. Tan added that the adoption rate of smartphone payment has not been encouraging over the years despite the tremendous benefits. “The award is based on the number of downloads worldwide in the first 90 days after publishing. This journal contains a high number of quality research papers produced by reputable authors. Therefore, it’s heartening that our paper was already one of the most downloaded within the first few weeks after it was published,” explained Tan. “One of our previous articles on NFC-enabled smartphone payment is also currently ranked second Most Cited Articles with Elsevier (USA)’s Telematics and Informatics journal,” said Tan, adding that research in the NFC field is gaining wide popularity. He foresees that there will be more research articles on NFC-enabled payments in the future. The Marketing researcher who hails from Ipoh also elucidated the fact that the paper is highly downloaded reflects many researchers’ interest in understanding more about the “Mobile Technology Acceptance Model (MTAM)” — a newly created model by Tan and his co-author Prof Ooi — and possibly applying it in their research papers. He said that many past studies on mobile technologies were constructed using electronic commerce literatures which do not reflect the actual mobile environment. “MTAM overcomes the limitations by being among the few models in the world that was specifically developed for researching mobile technologies,” remarked Tan, illustrating that the model can also be applied in various mobile adoption studies such as in mobile advertising, marketing, entertainment, healthcare, learning, shopping, tourism and social networking. He also expressed his sincere gratitude to UTAR and attributed the success of the article to the generous funding from the UTAR Research Publication Scheme. The Expert Systems with Applications journal is currently indexed with Thomson Reuters (ISI); Social Science Citation Index (SSCI); JCR-2015, IF = 2.981). “Mobile Technology Acceptance Model: An Investigation using Mobile Users to Explore Smartphone Credit Card” can be read and downloaded here.